Back to category: Printed Parasols: 4 Week Lead Time. Our Ultra Strong Printed Parasols have an incredible reinforced frame making them an ideal choice if you are looking for promotional parasols for a more exposed location. 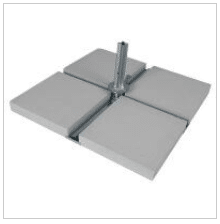 Their white aluminium frame is incredibly robust and is resistant to wind equalling 3 degrees of Beaufort Wind Scale. 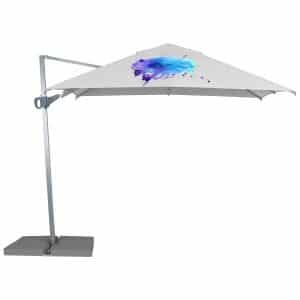 As well as exceptional coverage and durability, these Ultra Strong Parasols have an added canopy wind valve for extra stability & excellent air circulation. The reinforced central pole measures a huge 75mm and ribs, again white aluminium, measure an impressive 45mm x 18mm. 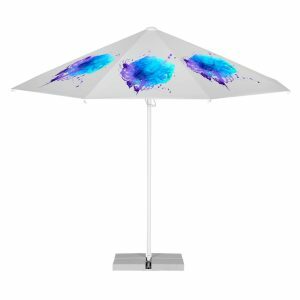 Our Ultra Strong Printed Parasols have a easy to use TVR (telescope-lever-handle) opening and closing system so you can put the canopy up and down quickly and simply. 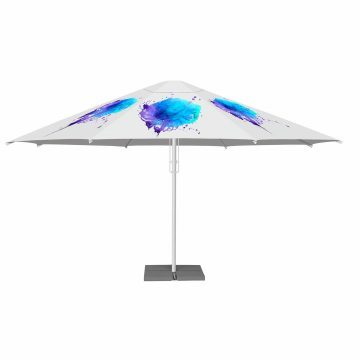 These promotional parasols come with a either a round canopy with 8 panels or a square canopy with 4 panels. You can opt for a valance which can also be printed. 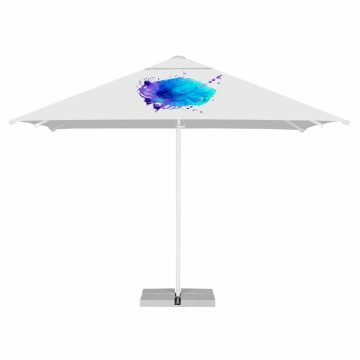 We can brand your promotional parasols with a simple logo print, or upgrade to all-over process print. We digitally print as standard allowing us to pantone match colours exact to your branding for a high end look. We use fade resistant canopy dyes, guaranteed to the highest fade resistance of the colours (7-8 degree according to ISO 105. B02), so you can trust your parasol will stay vibrant and eye catching. •	Will the parasol be attached to furniture e.g. 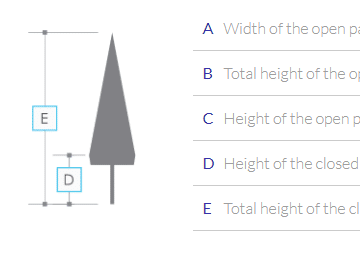 within a table or stand alone? •	Will the branded parasol be in a group of parasols? Round with 8 panels or square canopy with 4 panels. With or without valance. Polyester treated with a protection covering preventing water absorption and protects from rain, dust and harmful UV radiation. Shower proof. We utilise long lasting vivid ink & colour and our adopted techniques ensure crisp and clear printing so that even the finest detail is visible. Wide range colours available or opt for a digital print for pantone matching. Fade-resistant dyes used, guaranteed to the highest fade resistance of the colours (7-8 degree according to ISO 105. B02). We utilise long lasting vivid ink & colour and our adopted techniques ensure crisp and clear printing so that even the finest detail is visible. Here at Brollies & Parasols we specialise in customising promotional umbrellas and printed parasols specifically to our clients’ requirements. This means we have a full and extensive range of parasol branding options, resulting in promotional parasols that are completely attuned to your needs and branding. 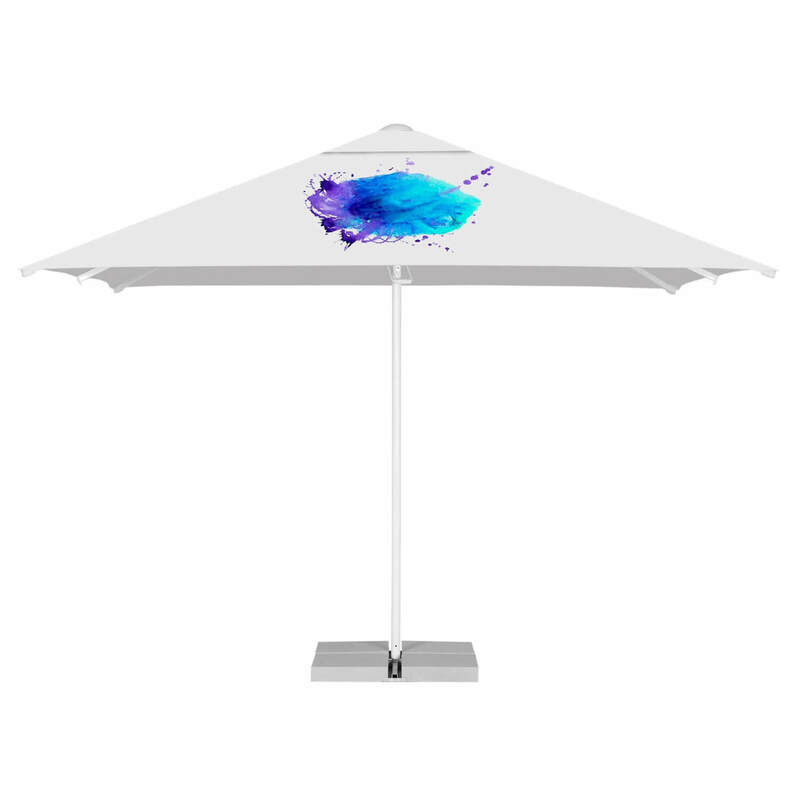 We custom-make all of our printed parasols which allows us to easily and cheaply add different finishes, components and printing options to your personalised sun umbrellas. As part of our service we are on hand to advise and guide you so if the number of options are a bit overwhelming just give us a call. Furthermore we would be happy to offer some friendly guidance on what would work best for your brand as well as within your budget. 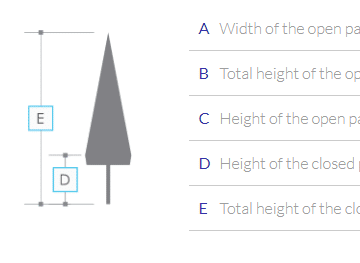 Need More Help With Your Printed Parasols? Furthermore if you need guidance selecting the right branded options for your promotional parasols, why not speak to one of the Brollies & Parasols team? Here at Brollies & Parasols we have in depth knowledge and experience in the world of printed parasols and as a result can offer expert advice. We are therefore very happy to assist you with any queries you may have. Or even guide you if you need any help choosing the right options for you and your branding. Just give us a call on 02920 494086.